The Unknown is the card that comes up when the Universe is not ready to give you information or to answer your question. The Universe has not yet put all of the factors in place to respond to the situation. Patience is needed before any decision is made or action can be taken. 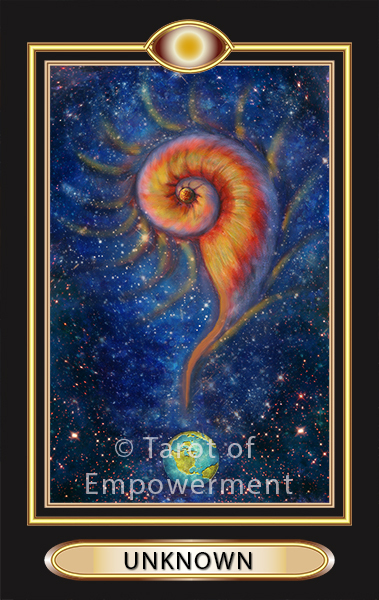 In Tarot of Empowerment, the nautilus representing the sacred geometry of the building block of the Universe creates the question mark symbolizing the unknown. Upright: When the Unknown card comes up in a reading, examine your question, your motivation behind the question. Sometimes there is no answer the Universe is willing to give you at this time. Empowerment: You are empowered by the Unknown card when you decide to trust spirit, even though you are not getting the information you requested. Reversed: The answer is still unknown. Numerology: There is no number with Unknown.